what a day!! It started well with morning coffee at the track with Dr Rob from Hobart and Adrian from Mildura. 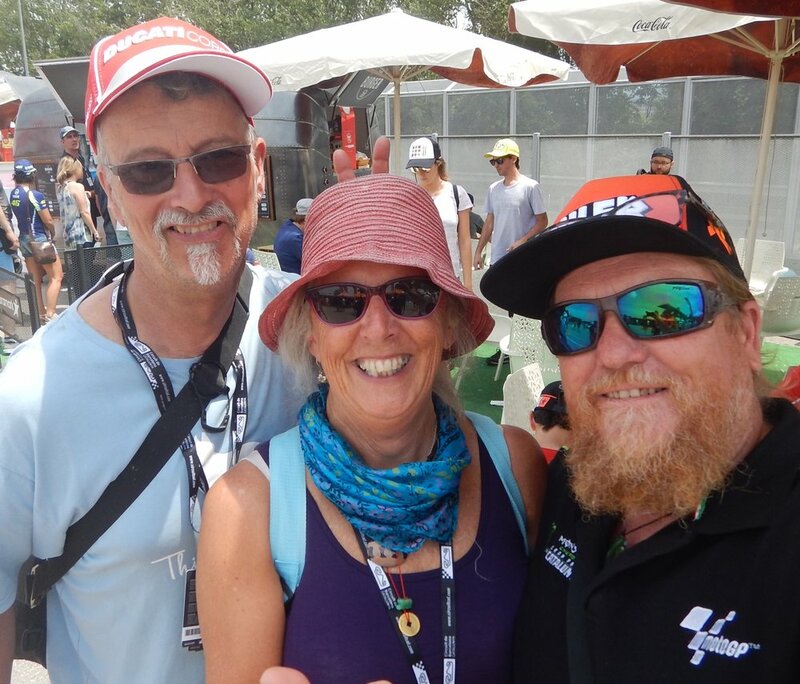 Rob arrived from the wheels and waves festival in Biarritz via the trans euro trail across the Pyrenees and Adrian has been roaring around Europe on his Hyabusa having a great time catching up with mates! Including moi! Winners are grinners, we didn't know then of course that Ducati rider Jorge Lorenzo would win moto Gp and Adrian is sporting a collectors item, Jack Miller cap. And I'm just me of course. 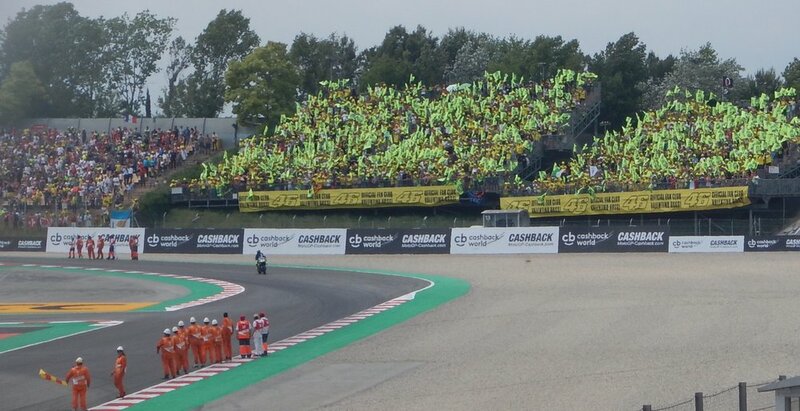 Rossis fan club do a great job waving their flags, this is on the warm up lap today. During the race they do not wave their flags so as not to distract him. lots of action in the remaining riders including one bike catching on fire. Rossi stopped by his fan stand for a big wave after the race finished. He and most other riders carried #77 flags on their victory lap and as a mark of respect for the tragic death last week of a junior champion rider as the result of a crash here at Catalunya no champagne was used on the podium. 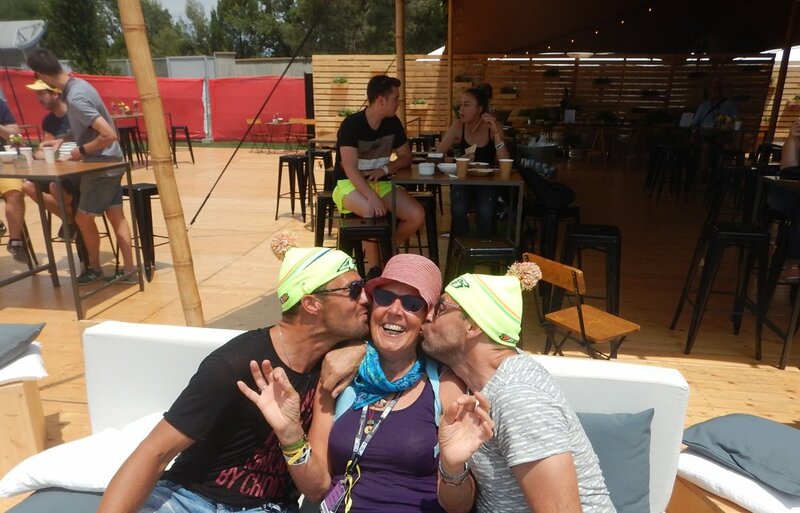 celebrating in the hospitality area with two Swiss Rossi fans. One of them mentioned his Dad used to race at Isle of Man. Check out these guys at the bottom of the page. They sent me this vid!!! My turn to celebrate a podium win for Rossi. Then back to the hotel and short walk to the beach for a swim in the Mediterranean.. So I've been to a MotoGP outside of Australia and had a wonderful day, and weekend really so now it's off to France to catch up with Aussie friends in southern France on my way to Davos in Switzerland.